From left, Claudia Martinez, Jasia Saunders, Mia Mitchell, and Marina Hernandez made it to the finals for the Army JROTC Leadership Bowl. Not pictured: Ashley Littlejohn. PHOTO BY ANDY SANDOVAL. 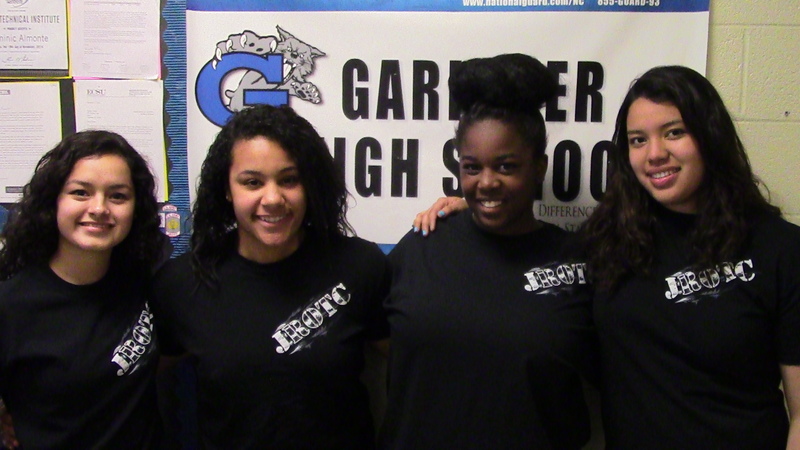 The Garinger JROTC team who consist of Marina Hernandez, Jasia Saunders, Ashley Littlejohn, Mia Mitchell and Claudia Martinez outperformed 1,320 JROTC units in order to compete in the finals for the National Army JROTC Leadership Bowl in an all expense paid trip to Washington, D.C. Leadership Teams selected to participate in the leadership Championship (JLAB) should have a solid working knowledge of leadership principles and classroom applications. Forty four – member teams earned the opportunity to participate in the Leadership Championship on the basis of their knowledge of the JROTC curriculum, their leadership skills and academics. The team had to overcome many complex obstacles such as ensuring the team consisted of the proper grade level, leadership and the desire in order to qualify. Due to inclement weather, our team was deprived of a week’s worth of studying and practicing in preparation for the test that was due. They said their greatest challenge was recovering the time lost. Junior, Jasia Saunders is the leader of the team and helped lead them to success. “Beginning is easy, continuing is hard, you can let it define you, destroy you, or strengthen you,” she said. This competition is sponsored by the College Options Foundation. The College Options Foundation is a non-profit 501 (c) (3) organization that is dedicated to enriching the academic development of high school students and assisting them in their preparation for higher education. There emphasis lies with serving military families and students who participate in JROTC. They accomplish their mission by providing resources for college admissions and funding, utilize student planning guides, college exam study guides, admissions tutorials and personalized counseling, and conduct spirited academic competitions for JROTC students nationwide. While in Washington, DC the JLAB team will participate in various events such as visiting the National Museum of American History, several monuments and the Smithsonian Institute with the guidance and instruction from their JROTC instructor CSM Jacqueline Thomas. The team always says, “The perseverance of a team builds a committed tomorrow.” The team’s reaction was very overwhelming when they were informed that they made it. The team is very elated to have made it to nationals, but is also motivated to come home with a win! The final competition will be held on June 26 in Washington, D.C. The Garinger JLAB team could come home with a Certificate of Excellence, a George C. Marshall Medal, and several awards for their JROTC uniforms. We wish our Leadership Team the best of luck!! Go G-Code!!! !